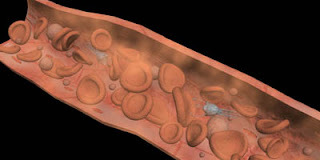 Nanorobots are of special interest to researchers in the medical industry. This has given rise to the field of nanomedicine. A nanorobot is a tiny machine designed to perform a specific task or tasks repeatedly and with precision at nanoscale dimensions, that is, dimensions of a few nanometers (nm) or less, where 1 nm = 10-9 meter. A typical blood borne medical nanorobot would be between 0.5-3 micrometres in size, because that is the maximum size possible due to capillary passage requirement. A major advantage of nanorobots is thought to be their durability. In theory, they can remain operational for years, decades, or centuries. Nanoscale systems can also operate much faster than their larger counterparts because displacements are smaller; this allows mechanical and electrical events to occur in less time at a given speed. 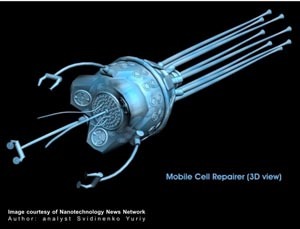 Nanorobots might also produce copies of themselves to replace worn-out units, a process called self-replication. Carbon could be the primary element used to build these nanorobots due to the inherent strength and other characteristics of some forms of carbon (diamond/fullerene composites), and nanorobots would be fabricated in desktop nanofactories specialized for this purpose. Scientists have created a microscopic robot from DNA molecules that can walk, turn and even create products in their own small nano-scale assembly line. Researchers have developed a robot spider measuring 4 nanometers, or about 100,000 times smaller than the diameter of human hair. The body of this robot consists of a protein called streptavidin. Attached to her leg three 'enzymatic DNA' single strand binding and fourth legs are the pieces that bring the spider to the starting point. It has been suggested that a fleet of nanorobots might serve as antibodies or antiviral agents in patients with compromised immune systems, or in diseases that do not respond to more conventional measures. There are numerous other potential medical applications, including repair or detect of damaged tissue and infection, unblocking of arteries affected by plaques, and perhaps the construction of complete replacement body organs. After the robot is released from the trigger, then he will tie and then cut the strands of DNA. After the string is cut, the robot legs began to gain line and DNA matching. with this, the robot is guided into the path set by the researcher. Nanodevices could be observed at work inside the body using MRI, especially if their components were manufactured using mostly 13C atoms rather than the natural 12C isotope of carbon, since 13C has a nonzero nuclear magnetic moment. Medical nanodevices would first be injected into a human body, and would then go to work in a specific organ or tissue mass. The doctor will monitor the progress, and make certain that the nanodevices have gotten to the correct target treatment region. The doctor will also be able to scan a section of the body, and actually see the nanodevices congregated neatly around their target (a tumor mass, etc.) so that he or she can be sure that the procedure was successful.